So I'll admit it, I'm one of those girls that has been planning my dream wedding ever since I was old enough to know what a wedding was! I remember being a bridesmaid when I was about 8 and getting a wear a poofy blue dress with huge bow on the back and carrying around a little basket of roses, which funnily enough I kept for months after until they went brown and crispy and then started to smell! But I felt like a princess and loved every moment of it! As you can probably guess it is the dresses that are my favourite part of weddings. I think I might still have some drawings of my dream wedding dress that I did when I was younger! And even now (although I don't tell people!) 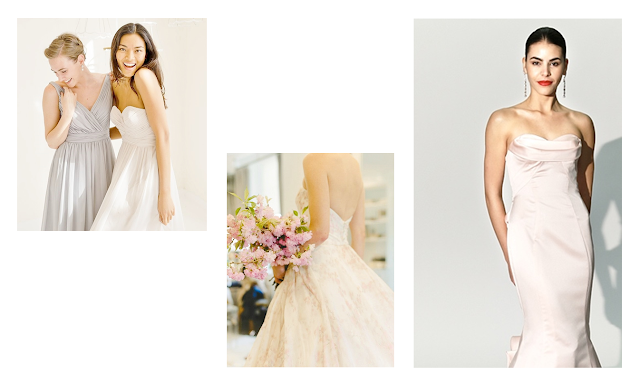 I like to have a little browse online at wedding dresses, my favourite website being Vera Wang! A girl can dream! So when I was given the opportunity to work with Weddington Way to cover the absolutely gorgeous exclusive images from Bridal Fashion Week, I jumped at the chance to write about the different trends and styles. Beautiful fashion, weddings and current trends. Couldn't be more perfect! 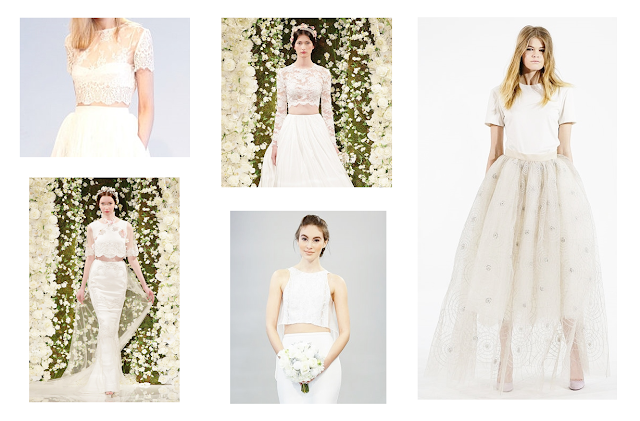 Crop tops are going to be huge this season, and bridal fashion is definitely no exception. To me this style is very fresh and new and almost challenging the very traditional wedding dresses. Lots of lace crop tops were seen keeping everything very pretty and feminine. And if you are showing some midriff at your wedding then it is best to cover up in other places (it is a wedding!) so long skirts, high necks and little sleeves. 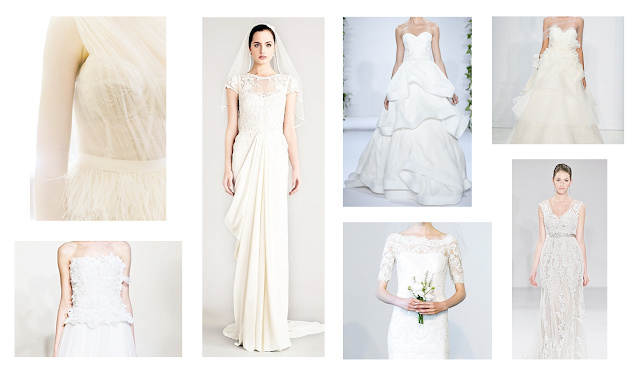 Who says a wedding dress has to be white? Another style that is really pushing the boundaries of bridal fashion this season. Colour palettes were usually kept to pastels but with beautiful shades of powder blues and peachy pinks. And some dresses, like the image in the middle even went as far as a subtle floral print. And with such a gorgeous and traditional style dress I think this really works, and is perfectly complimented by those matching pink flowers. 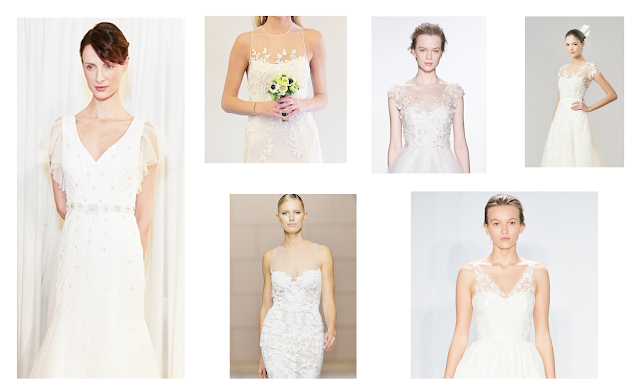 Embellishment is probably one of those trends that comes back every year in Bridal fashion. It's also one of my favourite trends as it is just so beautiful. This season think delicate beading and pretty sequins especially on the bodice and around necklines. 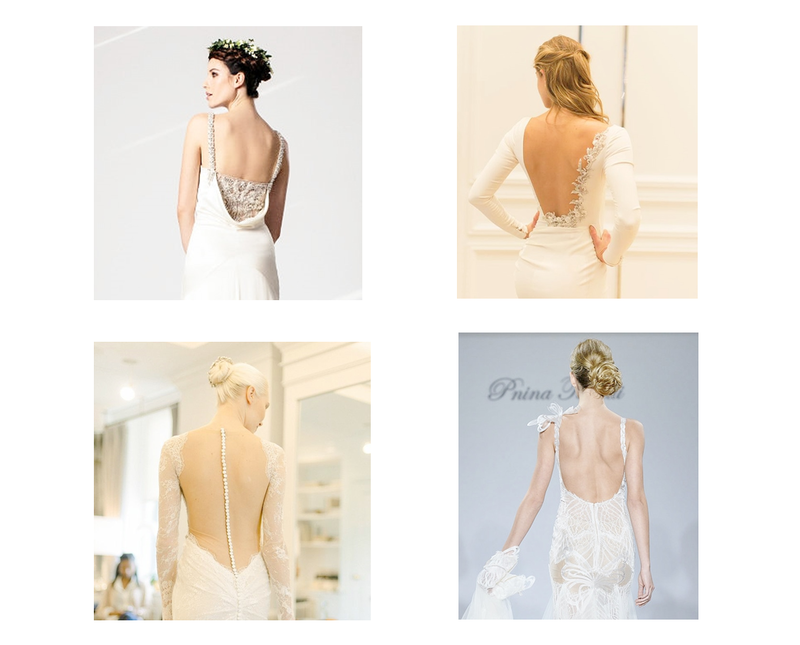 A lot of beautiful detailed low back dresses were seen on the runway. So if you're not brave enough to show your midriff with a cropped top then you can still flash a bit of skin. There are so many different ways to wear this trend, with some embellishment or as seen in the stunning sheer dress with the buttons down the back. Wedding dresses this season wee far from boring. Mixing up up texture can change both the look and feel of a dress. 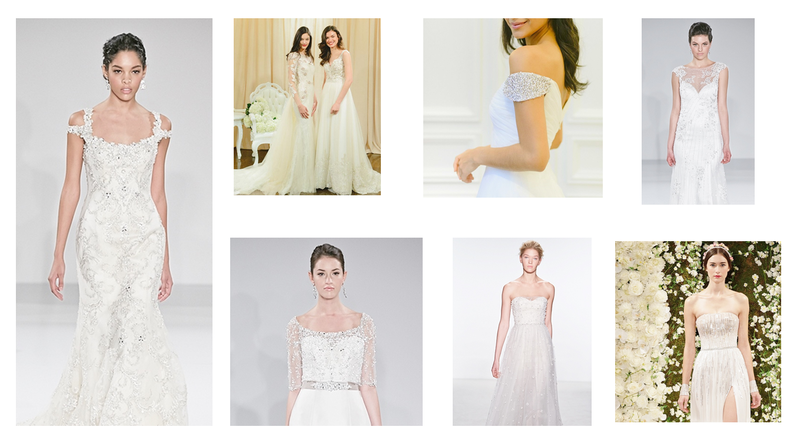 This season saw lots of lace, tulle, ruffles and even some beautiful white feathers. For a wedding dress white lace would be a classic, feminine look, tulle is quite fresh and feathers are really pushing the boundaries of wedding fashion which I love. How beautiful is that dress in the top left corner? Sheer fabrics where seen everywhere are Fashion Week this year. Sheer dresses and skirts are possibly not so wedding appropriate but this huge trend has definitely filtered into bridal fashion. The nod to the trend is most commonly seen by sheer bodice panels and sleeves. And often combined with lace detail and embellishment it can give the optical illusion that it is floating on the skin. This has to be one of my favourite new trends. It's is so delicate and stunning but also fresh and something a little different for a wedding dress. Photocredits also to Harpers Bazaar, ELLE, Popsugar, wwd, Brides, Fashionista and Vogue. Lovely post :) i've been planning my wedding since i was a little child and i'm still doping it! I love the separarate dresses, they're new and young but still elegant!